It's Callie’s seventeenth birthday and she's awaiting her vision?a memory sent back in time to sculpt each citizen into the person they're meant to be. In her vision, she sees herself murdering her gifted younger sister. Before she can process what it means, Callie is arrested and imprisoned, where she tries to escape with the help of her childhood friend, Logan. Now she must find a way to change her fate...before she becomes the most dangerous threat of all. 2016 RITA® Winner for Best First Book! Thanks to NetGalley for providing me with an eARC in exchange for an honest review. How about I start off with: I REALLY ENJOYED THIS! It's Pintip Dunn's debut novel and made me excited to read future books by her as well. Apparently this series is a trilogy and I ALREADY CAN'T WAIT! Thank you Entangled Teen and Ms. Dunn for the ARC! 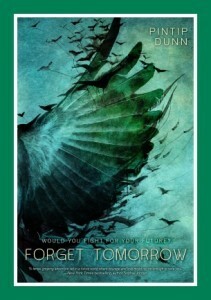 Forget Tomorrow by Pintip Dunn was a knockout! From the beginning to the end, there was never a dull moment. Why you should read it: BECAUSE IT'S FREAKING AMAZING AND YOU WILL FALL IN LOVE SO HARD THAT WHEN IT ENDS YOU'LL DIE A LITTLE ON THE INSIDE!!! This book was pretty good, but I think it could have still been a little stronger at moments. Thank you Netgalley for approving my request to read it in exchange for a honest review. I can’t wait for the next book in the series! I ended up giving this book 5 out of 5 stars. This book was actually really cool! I enjoyed it a lot more than I thought I would! I received this ARC from Entangled Teen Publishing. Many thanks to them for being awesome and allowing me to read this! All thoughts and opinions are my own! Copyright © 2015 by Pintip Dunn. All rights reserved, including the right to reproduce, distribute, or transmit in any form or by any means. For information regarding subsidiary rights, please contact the Publisher. “The next leaf that falls will be red,” my six-year-old sister Jessa announces. An instant later, a crimson leaf flutters through the air like the tail feather of a cardinal. Jessa grabs it and tucks it into the pocket of her school uniform, a silver mesh jumpsuit that is a smaller version of mine. Crunchy leaves blanket the square, the only burst of color in Eden City’s landscape. Behind our patch of a park, bullet trains shoot by in electromagnetic vacuum tubes, and metal and glass buildings vie for every inch of pavement. Their gleaming spirals do more than scrape the sky—they punch right through it. “Now orange,” Jessa says. A leaf the color of overripe squash tumbles from the tree. “Brown.” Sure enough, brown as mud and just as dead. “You going for some kind of record?” I ask. She turns to me and grins, and I forget all about tomorrow and what is about to happen. My senses fill with my sister. The voice that lilts like music. The way her hair curves around her chin. Her eyes as warm and irresistible as roasted chestnuts. I can almost feel the patches of dry skin on her elbows, where she refuses to apply lotion. And then, the moment passes. Knowledge seeps through me, the way a person gains consciousness after a dream. Tomorrow, I turn seventeen. I will become, by the ComA’s decree, an official adult. I will receive my memory from the future. Sometimes, I feel as if I’ve been waiting all my life to turn seventeen. I measure my days not by my experiences but by the time remaining until I receive my memory, the memory, the one that’s supposed to give meaning to my life. They tell me I won’t feel so alone then. I’ll know, without a shred of doubt, that somewhere in another spacetime exists a future version of me, one who turns out all right. I’ll know who I’m supposed to be. And I’ll never feel lost again. Too bad I had to live through seventeen years of filler first. Ten times, fifteen times, twenty, she correctly predicts the color of the next leaf to fall. I clap and cheer, even though I’ve seen this show, or something like it, dozens of times before. And then I notice him. A guy wearing my school’s uniform, sitting on a curved metal bench thirty feet away. Watching us. The back of my neck prickles. He can’t possibly hear us. He’s too far away. But he’s looking. Why is he looking? Maybe he has super-sensitive hearing. Maybe the wind has picked up our words and carried them to him. How could I be so stupid? I never let Jessa stop in the park. I always march her straight home after school, just like my mother orders. But today, I wanted—I needed—the sun, if only for a few minutes. I place a hand on my sister’s arm, and she stills. “We need to leave. Now.” My tone implies the rest of the sentence: before the guy reports your psychic abilities to the authorities. Jessa doesn’t even nod. She knows the drill. She drops into step beside me, and we head for the train station on the other side of the square. Out of the corner of my eye, I see him stand up and follow us. I bite my lip so hard I taste blood. What now? Make a run for it? Talk to him and attempt damage control? His face comes into view. He has closely cropped blond hair and a ridiculously charming grin, but that’s not why my knees go weak. It’s my classmate, Logan Russell, swim team captain and owner of what my best friend Marisa calls the best pecs in this spacetime. Harmless. Sure, he has the nerve to smile at me after ignoring me for five years, but he’s no threat to Jessa’s well-being. When we were kids, his brother Mikey made a racquetball hover above the court. Without touching it. ComA whisked him away, and he hasn’t been seen since. Logan’s not about to report my sister to anyone. “Calla, wait up,” he says, as if it’s been days instead of years since we sat next to each other in the T-minus five classroom. He remembers? I look away, but it’s too late. I can smell the protein pellets we made a pact never to eat, feel the touch on my shoulder when Amy Willows compared my hair to straw. I had gone home and daydreamed I’d received the memory from my future self, and in it Logan Russell was my husband. Of course, that was before I learned the older girls waited until a boy received his future memory before deciding if he was a good match. Who cares if Logan has dimples, if his future doesn’t show sufficient credits to provide for his family? He may have a swimmer’s physique today, but it might very well melt into fat twenty years from now. By the time I figured out my crush was premature, it didn’t matter. The boy of my dreams had already stopped talking to me. Instead of responding, he moves behind Jessa. She’s taken the leaves from her jumpsuit and is twisting them around each other to make them look like the petals of a flower. Logan sinks down beside her, helping her tie off the “bud” with a sturdy stem. Jessa beams as if he’s given her a rainbow on a plate. So he makes my sister smile. It’s going to take more than a measly stem to compensate for five years of silence. My arms and mouth drop at the same time. Of course he did. I’d just used his school name. How could I forget? Logan’s birthday is two days before mine. It’s why we sat next to each other all those years. That’s how the school orders us—not by last name or height or grades, but by the time remaining until we receive our future memory. I notice the hourglass insignia, half an inch wide, tattooed on the inside of his wrist. Everyone who’s received a future memory has one. Underneath the tattoo, a computer chip containing your future memory is implanted, where it can be scanned by prospective employers, loan officers, even would-be parents-in-law. In Eden City, your future memory is your biggest recommendation. More than your grades, more than your credit history. Because your memory is more than a predictor. It’s a guarantee. He takes a step closer. I’d forgotten his eyes are green. They’re the green of grass before summer, a sheen caught somewhere between vibrant and dull, as if the color can’t decide whether to thrive in the sun or wither in its heat. I can’t believe I said that. We spend our entire childhood learning how to choose the proper memory, one that will get us through the difficult times. And here I am, telling another person he screwed up the only test that matters. I didn’t think I had it in me. “Maybe,” he says, but we both know it’s not true. Logan is smart, too smart to be beat by me in the T-minus seven spelling bee, and too smart to mess this up. He wasn’t kidding, something inside me yells. He’s trying to tell you something. But if Logan’s one of the anomalies I’ve heard rumors about—the ones who receive a bad memory, or worse, no memory at all—I don’t want to know about it. We haven’t been friends for half a decade. I’m not going to worry about him just because he’s deemed me worthy of his attention again. It’s the standard salutation, spoken the day before everyone’s seventeenth birthday. In the past, Logan’s address would have filled my cheeks with warmth, but this time his words only send the chill creeping up my spine. We walk into the house to the smell of chocolate cake. My mother’s in the eating area, her dark brown hair twisted into a bun, still wearing her uniform with the ComA insignia stitched across the pocket. She’s a bot supervisor at one of the agencies, but she gets paid by the Committee of Agencies, or ComA, the governmental entity who runs our nation. My mother turns. Powdered sugar clings to her cheek, and chocolate frosting darkens one eyebrow. The red light that normally blinks on our Meal Assembler is off. Actual ingredients—packets of flour, a small carton of milk, real eggs—lay strewn across the eating table. “But how did you…” My voice trails off as I spot the small rectangular machine on the floor. It has a glass door with knobs along one side, two metal racks, and a coil that turns red when it’s hot. An oven. My mother bought me a functioning oven. She hoists Jessa onto her hip and pulls me into a hug so that we are in a circle of her arms, the way it’s always been. Just the three of us. I have few memories of my father. He is not so much a gaping hole in my life as he is a shadow who lurks around the corner, just out of reach. I used to pester my mom for details, but tonight, on the eve of my seventeenth birthday, the heavy knowledge of him is enough. My mother begins to clear the ingredients off the table, the bare, gleaming skin of her wrist catching the light that emanates from the walls. She doesn’t have a tattoo. Future memories didn’t arrive systematically until a few years ago, and my mother wasn’t lucky enough to receive one. We sit down to a dinner usually reserved for the New Year. Everything has the slightly plastic taste of food prepared in the Meal Assembler, but the spread itself is unrivaled by the best manual cooking establishments. A whole roast chicken, its skin golden brown and crispy. Mashed potatoes fluffy with butter. Sugar snap peas sautéed with cloves of garlic. We don’t talk through most of dinner—can’t talk, our mouths are so full. Jessa savors the snap peas like they are candy, nibbling at the ends and rolling them around her mouth before sucking the entire pods down. Mom’s hand stills on the serving spoon. “What boy?” she pries. The chicken suddenly feels dry in my mouth. I messed up. I know that. But I couldn’t bear to be stuck inside today. I needed to feel the sun’s warmth on my face, to look at the leaves and imagine my future. My mother pulls the necklace from under her shirt, where it normally resides, and rubs the cross between her fingers. We’re not supposed to wear religious symbols in public. It’s not that religion is illegal. Just…unnecessary. The traditions of the pre-Boom era gave their believers comfort, hope, and reassurance—in short, everything that future memory provides us now. The only difference is we actually have proof that the future exists. When we do pray, it’s not to any god, but to Fate herself and the predetermined course she’s set. But my mom can be excused for clinging to one of the old faiths. She never got her glimpse of the future, after all. At least, I don’t think he would. Why did he talk to me today? For all I know, he was spying on Jessa. Maybe he’s working for ComA now. Maybe his report will be the one that sends my sister away. Or maybe it has nothing to do with Jessa. Maybe the falling leaves reminded him of another time, when we used to be friends. My mind drifts to an old book of poems Mom gave me for my twelfth birthday. Pressed in between the pages, next to a poem by Emily Brontë, is a crumbling red leaf. The first leaf Logan ever gave me. A small piece of my heart, one I didn’t even know still existed, knocks against my chest. She plunks the stand on the eating table and lifts the dome. The chocolate cake is higher on one side than the other, the frosting glopped on and messy. Each mark of the handmade-ness reproaches me. See how hard your mother worked? This is how you repay her? The chocolate cake swims before my eyes. This is so unfair. I would never let them take Jessa away from us. My mother knows this. I just wanted to see the sun. The world is not over. “That’s not going to happen,” I say. “I will! You’ll see. I’ll get my memory tomorrow, and in it we’ll be happy and safe and together forever. Then you won’t be able to yell at me anymore!” I leap to my feet, and my arm knocks the stand. It tips onto the floor, breaking the cake into a hundred different pieces. Jessa cries out and runs from the room. I’d forgotten she was still here. My mom sighs and moves around the table to put her hand on my shoulder. The tension melts away, leaving behind our shared guilt for arguing in front of Jessa. “I’ll talk to Jessa.” I usually leave the hard stuff to Mom, but I can’t bear to sift through the chocolate cake, hunting for the few parts I can salvage. “I love you, dear heart,” my mother says, which isn’t a reply but answers everything that matters. Jessa is curled on the bed, her purple stuffed dog, Princess, tucked under her chin. Her walls have been dimmed, so the only illumination comes from the moonlight slithering through the blinds. “Knock, knock,” I say at the door. She mumbles something, and I walk into the room. Sitting on the bed, I rub her back between the shoulder blades. Where do I start? Mom’s so much better at this than me, but since she took an extra shift at work, I’ve had to pinch hit for her more and more. So I gave my sister a bowl of ice cream when Alice Bitterman told her they were no longer friends. And when Jessa said she was afraid of the monsters under her bed? I gave her a toy Taser and told her to shoot them. Maybe it’s not the best parenting in the world, but I’m not a parent. Jessa turns her head, and in the glow of the walls, I see tears in her eyes. My heart twists. I would give up every bite of my dinner to take the sadness away. But it’s too late. The food lodges in my stomach, heavy and dense. If she only knew. I’m scared of everything. Heights. Small, enclosed places. I’m scared no one will ever love me the way my father loved my mother. I’m scared tomorrow won’t give me the answers I’ve been waiting for. “The tickle monster!” I attack. She shrieks and squirms away, her head flinging out. I wince as her face almost smacks the metal headboard. But this is what I want. A laugh that jerks her entire body. Screams that come from the pit of her belly. After a full twenty seconds, I stop. Jessa flops across her pillow, her arms dangling over the edge. If only I could wipe out the topic so easily. I look at her scrawny legs, the knees scabbed over from falling off her hovercraft. She’s right. This is ridiculous. Jessa’s talent is a parlor trick, nothing more. She can see a couple minutes into the future, but she’s never been able to tell me anything really important—how I’ll do on a big test, say, or when I’ll get my first kiss. It’s the eve of my seventeenth birthday. I need to call Marisa, speculate with her one last time what my memory will be—if I’ll see myself as a Manual Chef or have a different profession altogether. It’s been known to happen. Look at Rita Richards, in the class ahead of me. Never touched a keyboard in her life, but her memory showed her as an accomplished concert pianist. Now, she’s off studying at the conservatory, all expenses paid. And earlier this year, Tiana Rae showed up to school with bloodshot eyes when her memory revealed a future career as a teacher instead of a professional singer. Still, we all agreed it was better to find out now that it wasn’t meant to be, rather than spend an entire life trying and failing. Whatever the possibilities, one thing is clear: I need to be in my own bed tonight, alone with my thoughts. But Jessa won’t notice if I leave ten minutes after she falls asleep. And tomorrow, she won’t remember she asked me to stay. “Okay.” I cross back to her bed. “I promise.” It’s a lie, but a small one, so white it’s practically translucent. I can’t be concerned. This is it. The moment I’ve been waiting for all my life.